In my younger days, I had been an avid painter with oils, but I hadn't used them for decades. I bought acrylics and experimented (and of course as an educator, I used lots of tempera), but I never quite felt the same way about acrylics as I had about oils, and only used them sporadically. With oils, I had loved the mess, the smell, the luminosity of the color, and the ability to move the paint around. The truth is, for my whole life my priority was to make art, but I didn't always want to be a teacher. Somehow, it's something that just sort of happened, based on parent advice and college choice. I was always a strong student academically, so I was ready for a science/math-related career if colleges didn't accept my art portfolio. But my portfolio was accepted, and then an academic quirk helped me to make my choice. The art ed program at SUNY New Paltz (at that time, actually, it was SUC of NY, not SUNY; a college, not a university. But I digress) was a BS degree, with a double major in fine art and education. For some reason, since it was a BS degree and not a BA, there was NO FOREIGN LANGUAGE REQUIREMENT. Attempting to learn French was my academic kryptonite. I just couldn't do it. So the education program was my logical choice, and I therefore entered teaching through this rather odd bit of decision-making. Now, of course, I can't imagine if I had chosen any other career path. But I also never stopped needing to make art. Anyhow, back to ANE. I decided to go, and as you saw in the photo above, I picked a workshop that would have me using oil paint, and keep me outside in the glorious summer sunshine: Landscape Painting. I signed up, and looked at the supply list in panic. 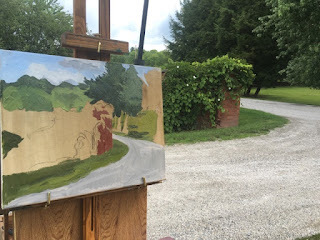 My 30+ year old oil paints were mostly unusable, and I was starting from scratch. Hundreds of dollars later, I was the proud owner of a pristine French easel for outdoor painting (possibly the coolest contraption imaginable; it is no longer pristine), a full range of oil paint colors, odorless mineral spirits, stand oil, a new staple gun for stretching canvas, and enough stretchers for more than a dozen canvases. I spent the week prior to the class stretching, gessoing, sanding, and gessoing some more. (I discovered later that most of my classmates had purchased pre-stretched/prepared canvases, or prepared panels. I was the only one that had done the stretch and gesso ritual!) Then I packed my car full of canvases and paints and easel and mini grocery cart and headed on my adventure. I was feeling pretty overwhelmed. 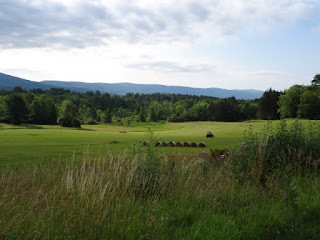 I chose my location for the waving plow line, not really visible in my photo of the location. I was surprised to receive some positive response to this painting, comparing it to a van Gogh. (WHAT?? Really??) But I was not smitten with the limited palette - as someone who loves vibrant color, yellow ochre as my only yellow and burnt sienna as my only red seemed very limiting. So for the rest of the week, I often experimented with different limited palettes. In the afternoon, rain threatened so we stayed close to our studios, which were separate from the Visual Arts building and the studios there. Below you can see our studios , outside and inside, on the final day. 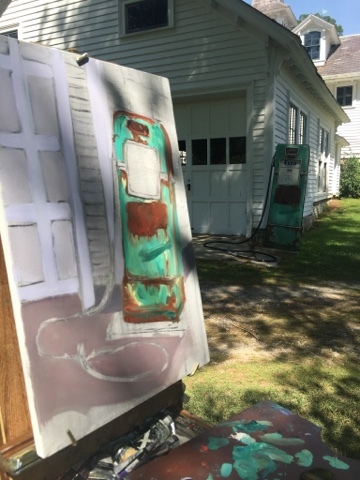 They were basically a bank of garages; very convenient for rolling your equipment in and out, and conveniently located for evening painting. Each bay was set up for two students. See the building right behind the studios? That was our dorm, just a quick walk late at night! And here they are at night. We were often in the studios at night, whether painting, or toning canvases, or cleaning brushes and palettes. On that first overcast and sometimes rainy afternoon, I painted from under the eaves of the library. Below, my painting is partway done, when I still sort of liked it. I'm not satisfied with the final outcome. After dinner, two of the instructors did artist slide talks, and then there was a life drawing open studio. The instructor talks continued on two other nights, as did the life drawing opportunity. In addition, the studios are open 24/7, so often evenings were spent cleaning brushes and palettes, or painting. It was an amazing opportunity to completely be immersed in making or talking art. The slide talks were all great, and the life drawing open studio opportunity was terrific too! For an entire week, we did nothing but make art, look at art, talk about art, and make more art. I did not see a TV for the entire week. Our class ate meals together, and 12 people who started as strangers now feel like old friends. It was a totally immersive art-making experience, and reminded me of the need to make art that is buried deep in my soul. Anyhow - The sun came out the next morning, and we headed to a lovely location on the campus. I chose a spot with vines growing on a crumbling brick wall. I painted on a canvas toned with an ochre. Honestly? I had never done an oil painting on toned canvas before, and now I doubt that I will ever again paint WITHOUT first toning my canvas! I loved having the color of the canvas play a part in the final work. I kind of liked the painting, but it was sort of dark. 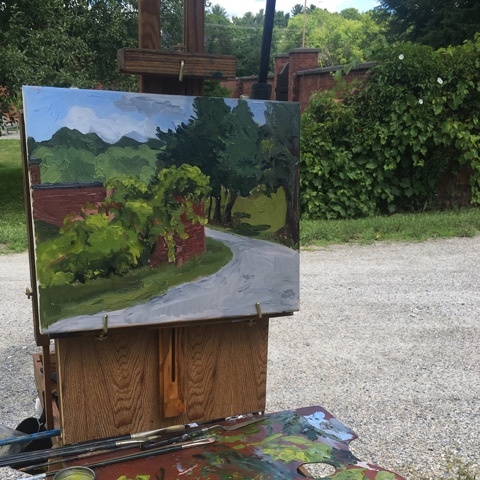 Halfway through the painting, the teacher realized the sun had moved and was shining on my palette and canvas directly, causing me to think my colors were brighter/lighter than they were. He set me up with an umbrella. When the wind blew, I hung on to the umbrella and instead, my hat blew off my head and landed upside down on my messy palette! (It is now officially my painting hat.) Here's the painting, below. On my shopping list? A painting umbrella. 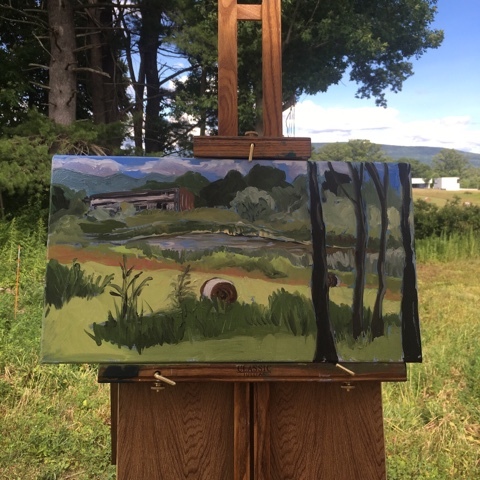 We moved to another lovely campus location in the afternoon, and again, I was happier with my morning painting than my afternoon painting. The pond is all wrong and I plan to re-work it. 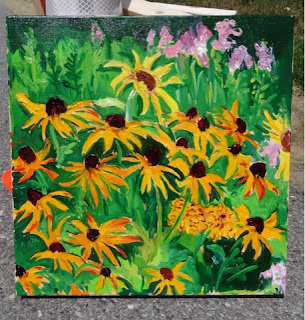 The third morning, on campus, I painted a stand of colorful flowers and while there's a lot wrong with the painting, suddenly I felt like I was starting to hit my stride and feel some confidence; I think the vibrant colors of the flowers reawakened me. Plus I discovered I was generally more interested in painting intimate settings than scenic vistas. Here's how I was set up, complete with umbrella and orange cones to make sure cars knew I was there! 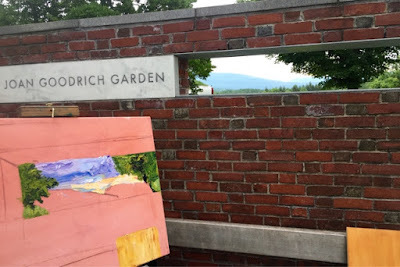 The Bennington college security and grounds staff are enormously accommodating and welcoming, never once complaining about we painters in awkward places on the college grounds. For the next day-and-a-half, our class painted on the grounds of the beautiful Park-McCullough Historic House in North Bennington. 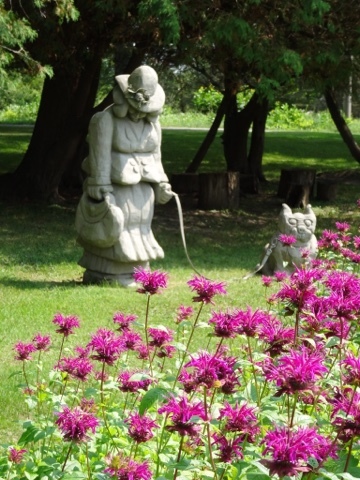 For more info about the Park-McCullough House click HERE!) 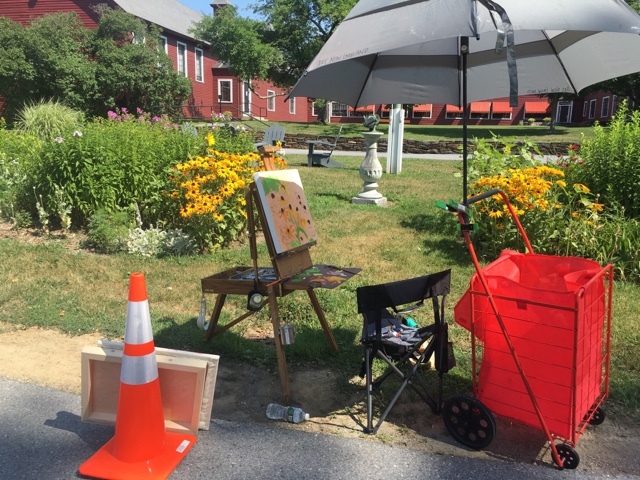 Again, we painters with our grocery carts and oil paints and easels were welcomed, as the students in a music summer camp played music and romped on the grounds. There was so much to see here; so many alternatives for painting locations. For my first painting on the grounds, I found a wacky statue near a garden. 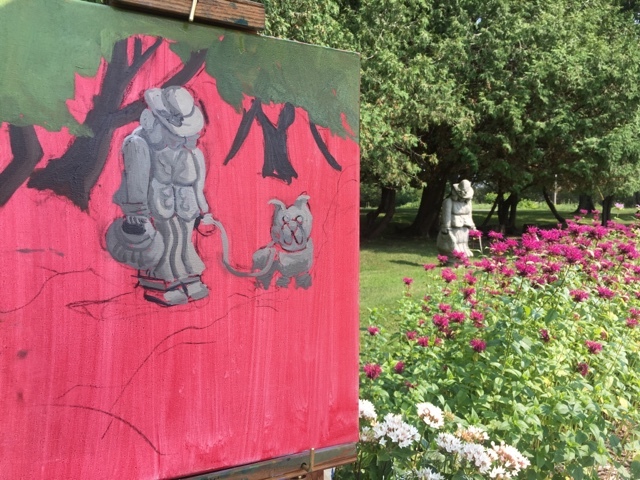 I still plan to brighten the sunlight on the statue, and work more on the negative space of the painting. 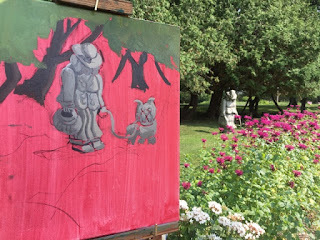 On a lark, I had toned a canvas with a mix of alizarin crimson and rose madder. The photo below shows how I began the painting. 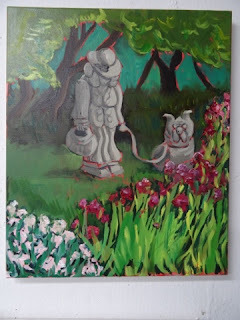 Even in the final work, you can see glimpses of that crazy pink showing through, and since the statue and painting are both kind of quirky, I like the influence of the pink ground. After dinner, some of us noted the rosy gold early evening sunlight, and headed back to the studios. 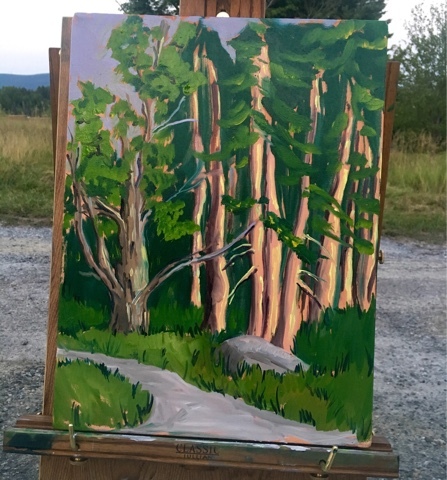 A couple of us set up right outside the studios and painted the lovely glow on the stand of nearby trees. I did no pre-drawing, due to waning sunlight, which was really fun! I want to re-visit the road, but otherwise I doubt I will change the painting. We returned to Park-McCullough in the morning. I had picked out a location the prior afternoon, but when I realized how different the morning light was, I scouted another location. 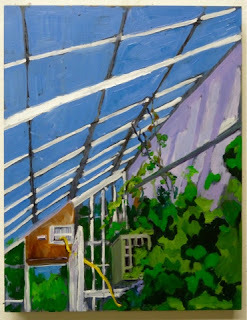 I discovered this greenhouse, still shady and cool. I asked permission and was welcomed to set up my easel and paints inside. I worked on a canvas toned with ultramarine blue, and did my pre-drawing in charcoal, looking up toward the ceiling. The gray lines in the ceiling of my painting? They are actually the charcoal lines on the toned canvas! When painting plein air with limited time, you need to find ways to get done, and my teacher suggested leaving the charcoal lines. 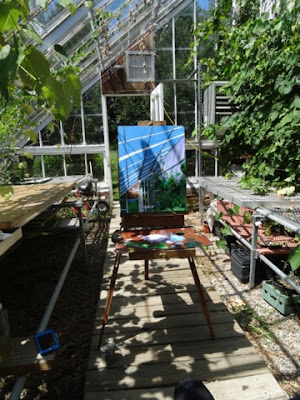 It stayed cool and pleasant in the greenhouse until about a half hour before I stopped painting. Then the sunlight streamed in and it turned into.... a hothouse!! 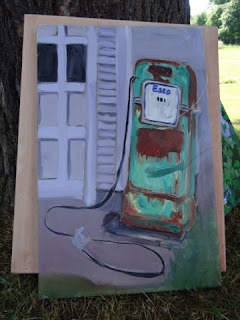 In the afternoon, another gal and I both selected this funky old gas pump to paint. The sunlight changed rapidly, and my painting is dull, and drab, and I plan to completely change the color tone of the garage, and fix its structure. I simply ran out of time. Back to campus on the final day, with changeable skies, impending heat and humidity, and a tired body, I struggled to figure out where to paint until I happened onto a patio of the library and discovered this strange long window. You can't really tell from this poorly exposed photo, but there was gorgeous stretch of sky with a yellow glow at the horizon in the landscape seen through the window. 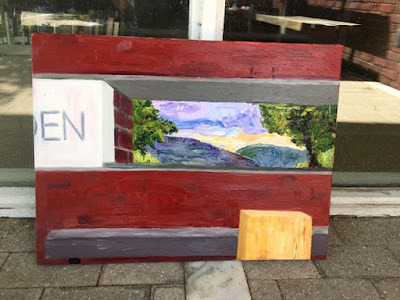 I parked myself on the patio where there was ready cover from rain, and spent most of the day there, mostly myself, doing this painting. I painted the landscape within the window using a palette knife only, and used brushes for the rest of the painting. I plan to re-work the the painting a bit, in particular the brick wall, darkening the tone and suggesting the bricks. The color does not look true in this photo below, taken in bright sunshine. 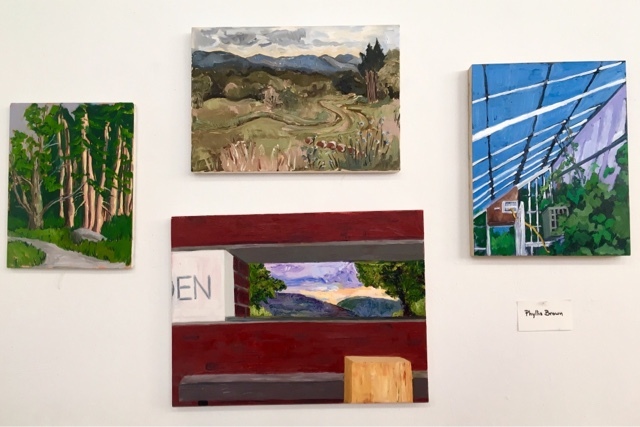 The week ended with a Friday evening Studio Tour, as participants in all 6 classes shared their week's work, a party, and then a final class critique on Saturday morning. So - one week, 10 oil paintings, and one very exhausted body later, I returned home. I actually had to call my husband and ask him to come and help me get them all home! Ten wet paintings in one car? Next time I'll bring some sort of rack, or pizza boxes! Here are the paintings, safely home in my tiny studio. So what, besides 10 wet paintings, was the takeaway? So, so much! First of all, I've got 12 wonderful new friends (including a kind and intelligent instructor), with diverse backgrounds and painting experience, who will honestly critique my work and support my artistic endeavors. There were no "attitudes" in the class; we all got along great and supported each other. I learned as much from them as from the instructor. Second, I will now have a plein air buddy; a gal in my class who lives less than an hour away. We plan to meet periodically to paint. Third, my "art brain" has totally been turned on. Everywhere I walked on the campus by week's end, and everywhere I've gone since, I'm seeing patterns of dappled light, and compositions and possibilities for future paintings, as in the photos below. It's very exciting; there's a been a change in my brain. If I return to ANE next year (and I hope that I do), you can bet I'll be painting this "papa bear, mama bear, and baby bear" trio of fire hydrants! Fourth, I discovered that I still love oil paint, and color, and I still WANT to paint. 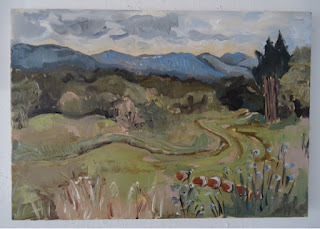 And I feel I have more of a focus: I discovered I love to search for the unusual, and possibly humorous or quirky things to paint, whether landscapes or still lifes or whatever they might be. Fifth, I learned so much and I have so much to learn. For example, I need to pay more attention to value and color temperature. I need to remember to get down to the essence of my subject. I'm not trying to create a photograph. There is a special elegance to the economy of a simple, meaningful well-placed brush stroke. "The elegance of economy" - I like that!! And finally, I discovered the confidence in knowing I can do this! 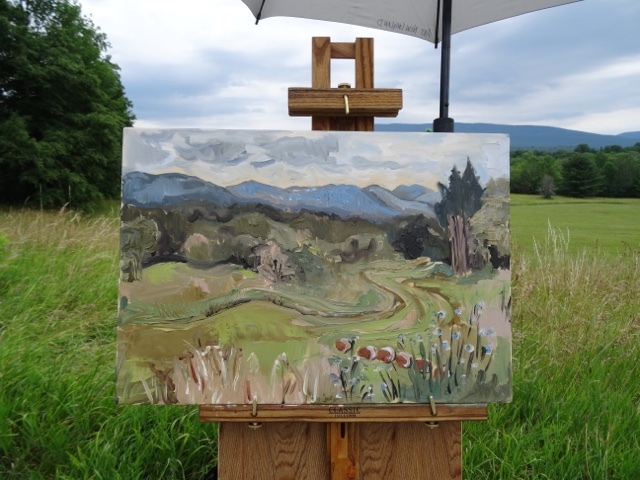 From the physicality of dragging a cart of materials up a hill or through the woods, to the know-how for setting up a French easel and managing materials on location, I know I can do it. My only regret is that it took me so many years to commit to going to this program, and to remind myself that I want to paint. I think all of us who teach art, we ultimately begin with a love for making art. We let life get in our way, and forget what was so important to us when we started. But folks, I have discovered it is never too late to rediscover it, and I want to remind you to do the same! Have you ever had a profound art-making experience? I've been AWOL, doing something I am excited to tell you about... but I'll tell you about it in my next blog post. Today, I want to take a momentary break and give you an update on Henrietta, the paper-mâché chicken I built for a chicken Wing Fest trophy more than a year ago in April 2015, along with a chicken wing trophy holding a bottle of hot sauce. (Henrietta, by the way, is named after the large chicken in the zany Daniel Pinkwater children's book The Hoboken Chicken Emergency, a favorite of my son during his childhood.) I wrote about the details of building these trophies in a blog post of April 2015. You can find that post HERE. 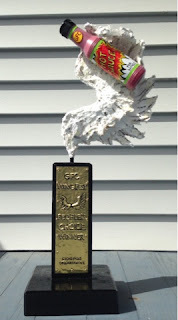 In May 2015, the first annual Glens Falls NY Wing Fest was held, and ironically, both trophies were won by the same local pub, who proudly displayed them in their window for the entire year. I admit I had a hard time saying goodby to Henrietta when she left my home to embark on her new adventure. In May, 2016, the 2nd annual Wing Fest was held and there was a tie, between that same pub, and a new local dinner-and-movie restaurant. Barely a block apart on the same downtown street, they agreed to share the custody of the trophies over the coming year. 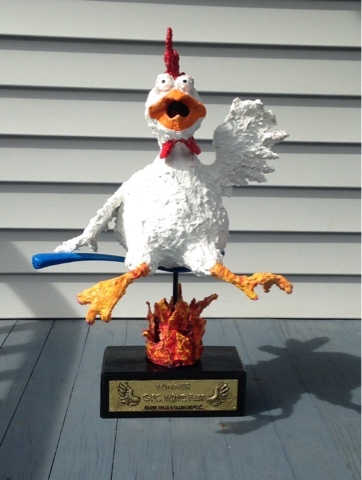 Meanwhile, this past winter I was contacted by a woman in Chicago, who had seen a photo of Henrietta online, and was hoping to commission me to make a trophy for their Wing Fest, too. Ultimately, her committee decided to work with someone locally, but I was flattered by the attention. Why am I telling you about that now? 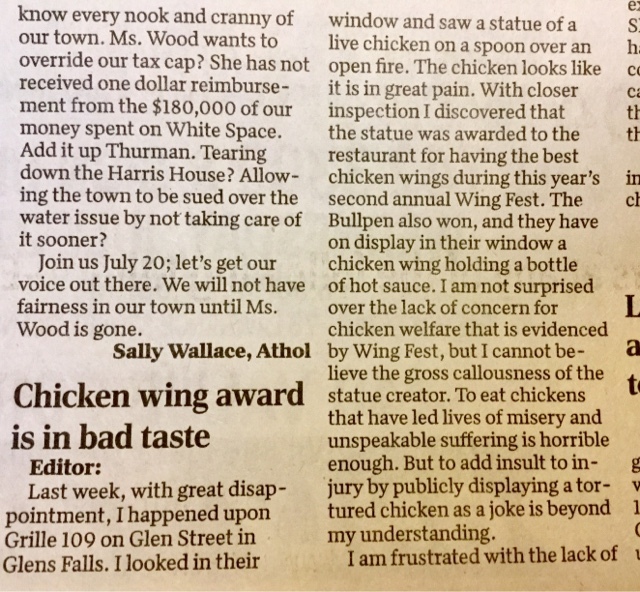 Because a few days ago, when I was out-of-town doing the exciting thing I'll be telling you about in my next blog post, a local animal rights activist suddenly noticed the chicken trophy in one of the restaurant windows, and wrote an angry letter to the editor of the local newspaper, titled "Chicken wing award is in bad taste". My husband shared it with me when I got home, and IAnd I've been having a good laugh about it ever since. Here's most of the letter. 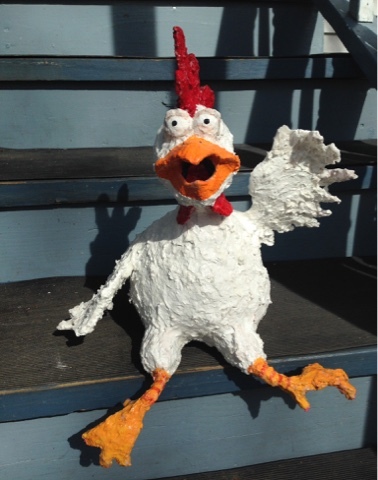 I am not heartless, but never in my wildest dreams did I think that the ridiculously goofy expression on the face of my paper-mâché chicken would be interpreted as being "in great pain", that I would be accused of "gross callousness" for my design, and that my silly chicken would incite an angry diatribe on animal rights. I mean, this chicken is made from TOILET PAPER! Yes, it's a papier-mâché mash of mostly shredded toilet paper, with flour, Elmer's Glue-All, and joint compound! Today I wrote a rebuttal letter to the editor of the paper, and I look forward to seeing it in print. With a 300 word limit, I had to restrict my thoughts, but luckily I have no word limit here on the blog. 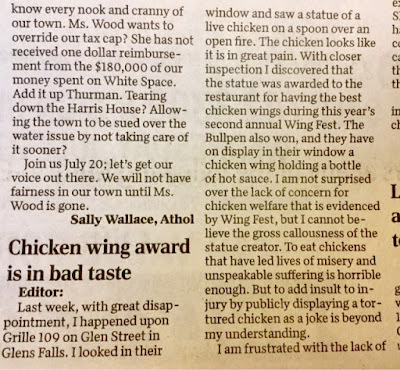 So I am able to muse over the ridiculousness of his letter, when there are so many more horrific things going on in the world than the imagined demise of a paper-mâché chicken at the hands of a papier-mâché ring of fire! And I can wonder why it took the letter-writer more than a year to notice the trophies in the window. And I can be baffled why my chicken provoked such ire, when Disney movies, such as Bambi and The Lion King, regularly brutally kill off parents of young animals. Or when tv shows and movies regularly depict not only animals, but children in grave peril. Anyhow, I just wanted to share this silliness with you. And if I'm ever asked to make another Wing Fest trophy, I think for the next incarnation, the chicken will either be locked in stocks, or have it's head in a guillotine! 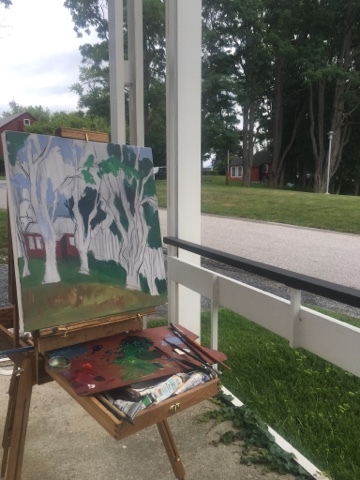 In the tiny hamlet of Shushan NY, seemingly in the middle of nowhere, you can find the Georgi on the Battenkill Community Park and Museum. I learned that the Georgi, while currently closed for renovations, had an exhibit of fairy houses scattered throughout the park. The display will only be there a few days longer, so I wanted to see it. Shushan is about a 50 minute drive from my home, along winding country roads, and my friend who was going to go with me canceled, so I went alone. Good thing! She would NOT have been patient with me, for two hours in 90 degree heat, laying on the ground taking pictures of the fairy and gnome dwellings! Above is my favorite of the houses. Shortly after I took this pic above and turned off my camera, a chipmunk appeared next to it, but as soon as I got my camera back on, he scampered off into the bushes and chattered at me! Below, one of a collection of tiny fairy mailboxes clustered at the base of a tree, all filled with tiny letters! There was an interesting house made from a gourd, and when you looked inside there were little benches arranged in a circle. And by another tree, there was an adorable arrangement with a wishing well and a pot full of "gold" wishing balls, as well as a fairy street signpost, and other little signs here and there. I made a wish that I hope will come true! I've never made fairy or gnome houses, but my third graders built papier-mache garden gnomes a few years ago (just before I retired), one of my absolute favorite projects. Here's a couple from that time that I really loved. Each gnome was unique; some had bows and arrows, baskets for gardening, fishing poles, and so much more, all out of the imagination of my third graders! I'm hoping my DragonWing Arts students will make some more of these, this coming winter. Maybe we'll make some homes for them too! I'll have to figure out how to do that, inside in the winter. Or maybe just make collages of their homes? Using a lot of natural materials? What do you think? Giant fake gardens in the middle of winter? Back to the display at the Georgi... There was a collection of pretty little houses all scattered around a "garden", complete with a swing, a table, and so much more. Many of these houses had little back porches and back doors, too. Then there was this odd little collection of fairies, tucked all over the place. I mean, what is this cork thing? A fairy-catcher? And there were interesting things hanging from trees, and so much more. There were lots of strings of lights, plus lights planted in the ground. I wonder when they are illuminated, since the park closes at dusk. I think it would be really pretty to visit the fairy houses at a misty dusk or dawn, all twinkling with little lights. Lots of little stone "owls" were tucked into trees here and there. The park is located on the Battenkill River; there's a lovely little swimming hole, plus the Battenkill is a great spot for fishing. The location of Shushan and the Battenkill is in eastern NY, just a few miles from the Vermont border, in lush rural countryside. Here are a few shots that show the environment. I'm including all three photos because I'm having trouble picking a favorite!!! Have you ever built fairy houses or gnome homes? I'm interested in hearing about different approaches to incorporating these environmental displays in an art program. Unfortunately, it's not always easy to bring students outside. For example, before I retired, my classroom was on the second floor, about a 10 minute walk from the only door we were allowed to exit and enter during the school day! It was simply impractical to take kids outside, because it didn't leave much time for actually making art. I preferred the first floor location of a former art room, where we could simply walk outside and sit with drawing boards. I'd love to hear from you if you've got any fairy house experience!! 4th of July Fireworks Fun!